I got into blogging after reading Twilight and The Mortal Instruments and following the fandoms. I started following some of them on Twitter, then they led me to book blogs. I think one of the first blogs I found was Mundie Moms and Cari’s Book Blog. Then I created my own! When I first set it up, my blog was called Read? Don’t Mind If I Do! – but then I realized I wanted something more brand-ish. I took suggestions from my readers and then did a poll! Gone with the Words won! Bit of trivia: the name was actually a suggestion from this blog’s very own Lety! While we review pretty much everything, the most is Young Adult books and Adult Contemporary Romance. Memes wise: Top Ten Tuesday. As far as Features, we have THURSDAY TRACKS, where I share songs, and we just started BITSY WORDS, our version of mini-reviews. By far it is getting to travel for book events with friends and meeting online friends in person. All the friendships that have come and will come from it. Having recently watched The Duff movie, my number one choice would be Bianca! Nope. Reading is my only hobby. If The Mortal Instruments REALLY does become a tv show, I’d love for The Infernal Devices to follow suit because WILL HERONDALE. I’ve loved how you’ve done this post all with GIFs too!! And I really have to agree with you, I want the Infernal Devices as a tv show series SO MUCH!! Loved reading more about you here! xoxo I reeeealllly need to read The Duff and I’m really wanting to see the movie. Should I go in blind to see the movie first? I hope the Mortal Instruments does become a TV show. I didn’t really like the movie that much, but maybe a show would be better? Oh my goodness! I have just fallen deeply in love with you beautiful blog! Also, A+ use of gifs. I just saw The DUFF too and I loved Bianca! I haven’t read the book just yet but I heard it’s different so I’m excited to dive in later this week once I finish The Sky is Everywhere! Nice to meet you Jess! Reading is kind of my only hobby too LOL. I had to stretch to get more. 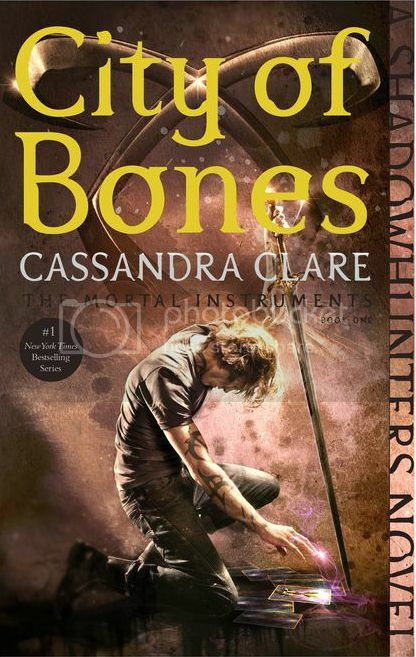 That certainly is an interesting cover for City of Bones. Never seen it anywhere before. I love to shop for makeup too! But I already have so much that I need to restrain myself and only buy anything when absolutely necessary. I am SO EXCITED for Six of Crows. I LOVED her Grisha stuff and I'm hoping to love her other grisha stuff too! Also, Bianca is AWESOME! I love her lots. I love contemporaries so much!! I love the song Hey Ya, that’s one of our prom song choices ;) Bianca would be a great choice, I loved that movie!! Lovely getting to know you! Makeup is so fun to shop for! I’m always picking up things I don’t need because I just can’t help it! I want to own everything in every color. This is an awesome post! I read the first two books (or three?) of the Violet Eden Chapters, and I have the next book to read. It’s definitely a series I haven’t heard much about, either. I haven’t seen The Duff yet, but I really want to! I actually just finished the book recently because I was so excited to see what it was about. I can’t wait to go see the movie! I haven’t read The Duff, but my sister saw the movie on Monday and loved it. The book is currently beside my bed, and I really want to get to it soon. I need to see what it’s all about. OMG. “Hey Ya!” I think you just became my best friend! Heeeeeeey yaaaaaaaaaa *dances*. No but seriously, this song is my jam in many ways! Awesome throwback. Also, I adore how GIFtastic your post is. It made me smile ;) My current takeaway from this post? I should check out Jessica Shirvington’s series. Your gif answers are great. Texas Forever indeed. Jesse’s Girl and Six of Crows, yes, so excited! OMG! Hey Ya! I used to dance like crazy in the car when that song came on! I still remember riding with my mom somewhere and she thought I had lost it. LOL. Love it! I am so excited for Six of Crows, The Devil You Know, and Jesse’s Girl! I’ve been meaning to read Shirvington’s series for awhile now, so I’m glad you’re giving it some props! I do a Music Monday feature so I’m excited to check out your Thursday Tracks! I love all things music. And yay for finding another blog that does multi genre! I like that you used a poll to decide your blog name. Seems like the best method when you can’t figure it out :D The friendships are definitely the best part about the community; the fangirling with like-minded people is amazing. I just realized I didn’t leave you any lovin’! LOVE THE GIFS!!! TEXAS FOREVER & RIGGINS, TOO! :) Twilight was my gateway book! I just need to start blogging now! So glad to learn more about you! First off many many props to your choice of jam as I am and alwsys will be a DIE HARD Outkast fan!! They just make you wanna shake it like a Polaroid picture! You blog is also so very adorable! I’m so glad I found it through this love-a-thon!